The diagram below shows the consumption of renewable energy in the USA from 1949 – 2008. Write a report for a university lecturer identifying the main trends and making comparisons where relevant. 1. The presented ___ shows the growth in the consumption of renewable energy from the year 1949 to 2008 in the USA. 2. As is shown in the illustration, over the period the use of ___ increased and ___ was the main sources for the renewable energy in the USA for the given period. 3. 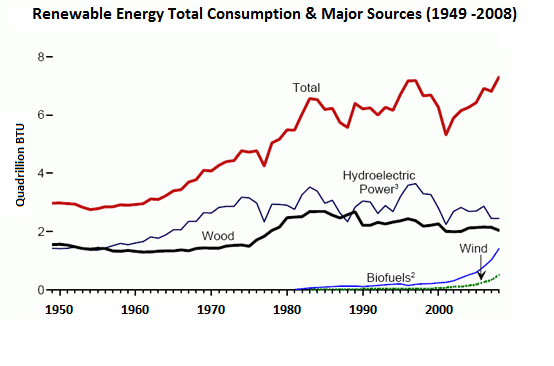 The use of renewable energy got more than ___ over the period, with particularly strong growth in biofuels. 4. Biofuel sector did not exist in until ___ but experienced a steep rise during the 2000s to over one quadrillion Btu per year. 5. The use of hydroelectric power was less than ___ quadrillion BTU in 1950 and showed many fluctuations. 6. Wood as a source of renewable energy showed a similar trend of hydroelectric power and both of these sources were challenged by the introduction of ___ and ___. 7. Finally, the wind power emerged late in the period but showed a gradual rise to around ___ quadrillion BTU. Quizzes are very effective to improve writing skills in IELTS. More quizzes should be added by this blog. This is really helpful. Thank you a lot!!! Please Someone help me. It’s a job interview question a company has given me to write down 200 words but I am a new candidate at Saifur’s Uttara branch Bangladesh. I don’t understand how will I write it down. It will be better for me if any body helps me. Do you believe at every stage of career progression, following/using all of these steps are equally important ? Explain your argument with valid examples. Good site for practice. Thank you very much. It is the best way to improve vocab in writing task. I need better ideas. This is a good source.